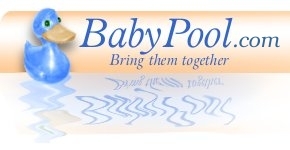 Hosting a baby pool or sweep and baby web site at BabyPool.com is a fun way to celebrate the birth of a newborn. Participants can guess the day and time of the birth and the weight and length of the baby, suggest names and view gift registry items. Expectant parents can share the joy and excitement of a pregnancy with their family and friends. What is a Baby Pool? Start a baby pool now. Take a look at the Demonstration Baby Pool. Do you want to host a baby shower but time and distance make getting all those guests together at one time difficult? Host a baby pool as a baby shower game and get everyone together online, send invitations and have your guests contribute to the purchase of baby shower gifts, it's easy. Tired of getting hit up at work to buy your colleague a gift? Well now you can do it with some fun and excitement. Host a baby pool for your office and get your co-workers to contribute and participate and someone will get to be a winner. 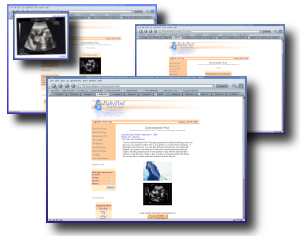 Design your own baby poll or survey for your participants. In your baby pool at BabyPool.com you can include baby polls or baby surveys to get your friends and family involved. For instance start a baby poll to determine what name everyone likes best or a baby poll to see who the baby will resemble the most. 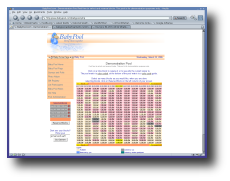 All baby pools are displayed graphically in a matrix. The matrix design divides the game into blocks. A day and hour baby pool would have the days running horizontally and the hours of a day running vertically. This design makes it easy for people to participate, all they have to do is click on the blocks they want to reserve and when a participant is done selecting blocks they click the "Reserve Blocks" button and enter their name and e-mail address. Read more about the baby pool page and matirx. What do you get with a baby pool at BabyPool.com? Once you register your Baby Pool has an Evaluation Status with limited functionality. This will allow you to evaluate BabyPool.com's service before you make a purchase. Purchases can be made in groups of 5 participants up to 25 participants at which time your babypool will allow an unlimited number of participants. Need More Info? Try a Search.